Inside: Need a kid-friendly appetizer for a party, holiday, or family dinner? Find out how to make this easy fruit and cheese mini-kabob snack with a presentation kids just can’t resist. “Mom! Can I help you cook?” my daughter asked and gave me her most charming smile. I pulled a stool over to the counter where I was working on and let her stand so she could see. I was preparing to host a holiday party at our house that evening. And I was working on making a fresh basil caprese salad for the adults, but I had also bought the ingredients for a kid-friendly appetizer too. Because eating dinner with family is much easier when there are food options that my kids actually enjoy. “Would you like to make some fruit and cheese kabobs with gourmet cheese for everyone?” I asked, knowing her what her answer would be already. My daughter loves being fancy, so anything frilly, fancy or gourmet is right up her ally. She slowly practiced with the word under her breath. Then, she gathered the ingredients for our kid-friendly appetizer one by one and set them on the counter. Stella Fontinella Cheese (cubed). See where Stella® cheese is available near you using the store locator. My daughter organized the festive holiday toothpicks for us next to the bowls. I picked a toothpick up and slid a piece of grape onto it. Next, we shimmied the cheese on together, and she finished the toothpick with a grape at the end. She stood next to me and repeated this pattern making more fruit and cheese mini-kabobs: grape, cheese, apple. I glanced over to see her plopping a piece of fruit into her mouth, which made me smile. I do my best to teach my kids healthy eating habits, so this kind of thing is a win when she is enjoys eating well. In fact, I’ve made a list of 10 healthy toddler snacks like this yogurt parfait or these healthy alternatives to kids favorite foods. We turned on some music as we worked side by side. She gently stacked her fruit and cheese mini-kabobs on the platter while I continued to cook. When she was done, she proudly picked the perfect spot to display her appetizer. Once our holiday party began, we stood around the kitchen with friends and family and devoured the appetizers. These fruit and cheese kabobs where a hit and my daughter was beaming every time she saw someone try her recipe. Plus, I loved that the kids had a healthy snack to munch on. I recommend using a more mild cheese like Fontinella, provolone or swiss for kids because of the taste, unless you know your child(ren) likes another kind. 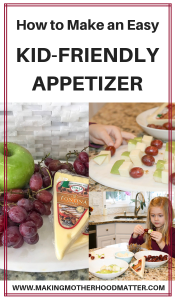 If you have young toddlers who want to try this appetizer too, you could use one of our favorite gadgets this grape cutter that easily slices grapes into four pieces, to prevent a choking hazard. Fancy toothpicks really do make this appetizer fun and attractive for kids and are in my opinion totally worth the extra dollar or two. We used these gold and silver stars toothpicks. 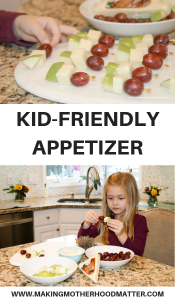 What kind of foods would you include in a kid-friendly appetizer for your family? Share in a comment below! 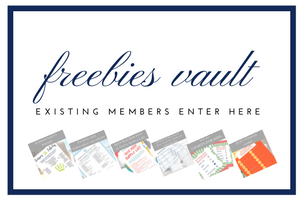 PS – If you enjoyed this piece, you may also like Weekly Meal Plans: How to Plan + 28 Days of Free Plans. Need a kid-friendly appetizer for a party, holiday, or family dinner? 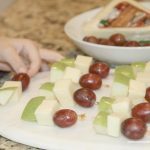 Find out how to make this easy fruit and cheese mini-kabob snack with a presentation kids just can’t resist. Cube the cheese and green apples. Wash and remove grapes from vine. Add the ingredients to a tooth pick. We put on the grapes first, then cheese and finally a green apple. Place on a serving dish and enjoy.